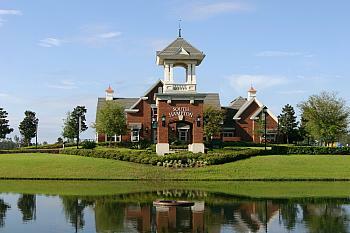 South Hampton golf community in Jacksonville, Florida. Welcome home to South Hampton, conveniently located on C.R. 210 about 3 miles west of I-95. South Hampton offers 799 homes with family living in a country setting with over 100 acres of parks, lakes and and picnic areas, as well as quick access to Downtown and the beaches. This exciting community also features an 18-hole Mark McCumber golf course with its own set of tees just for kids. For more vigorous activity there are adult and children's pools, walking trails, tennis and basketball courts, and a soccer field. South Hampton is located in St. Johns County, a unique place where important history, natural beauty and economic progress are friendly neighbors. With nearby beaches and waterways, preserved wetlands, eclectic shopping and dining, and easy access to downtown Jacksonville, it's no wonder St. Johns County is one of the First Coast's most desirable areas. A variety of home designs await for every lifestyle with lots available on the golf course, lakes, or nature preserves. Builders are Providence Homes, Beazer Homes, and ICI Homes. Convenient to schools, shopping and downtown Jacksonville, South Hampton is your place to discover the good life. South Hampton offers a wide variety of homes range in price from $300's to $1 millions. For a private tour and showing, please call (904) 307-8998.